rec. Menuhin Hall, Stoke d’Abernon, UK, 18 February 2010 (Busch), 3 April 2009 (Leighton), 9 October 2008 (Wordsworth) Music Hall, Guildhall School of Music and Drama, London, October 2005 (Cooke). 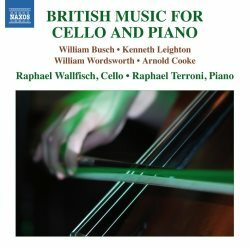 This disc is a praiseworthy reissue of a collection of recordings previously released by the British Music Society (Leighton ~ Wordsworth & Busch ~ Cooke). It derives from four separate sessions spread over period of nearly five years but all featuring the same artists. All of the works are unfamiliar — indeed the Wordsworth remains unpublished. Robert Kay’s booklet notes attribute this to an unwillingness on the part of all four composers represented to ‘push themselves’ and promote their own music. Add to this the fact that their adoption of a ‘conventional idiom’ led to their marginalisation by the BBC after 1960. Indeed even in recent years only Kenneth Leighton has made much in the way of inroads into the recorded repertory. Even so this appears to be the only representation of his Partita on disc. As such this CD is self-recommending to anybody interested in British music in the latter half of the twentieth century, and Naxos are to be congratulated on its reissue. Another possible reason for the neglect of this music, which Robert Kay does not mention, is the sheer difficulty of much of the writing for both instruments. All these works presuppose playing of superlative stature, well above the normal level of virtuosity, and it may well be that performers have been reluctant to spend the time and effort on pieces that will inevitably have a limited circulation. The original BMS release of the Leighton Partita remains available on a disc of the composer’s complete music for cello and piano issued in 2011. The other items in this collection appear to have disappeared from the current listings altogether although can be had via the BMS website. Raphael Wallfisch and Raphael Terroni have not allowed this to discourage them, and their poised and committed playing certainly makes out the best possible case for all the works here. The William Wordsworth sonata is probably the best of these pieces, and is certainly the most attractive on initial acquaintance. The work is in three linked movements, separately tracked here, and Robert Kay’s notes even cite the influence of Brahms on the music. Although the writing is largely lyrical rather than virtuosic, there is also a sense of brooding melancholy which is most definitely of the twentieth century. Although the work was written before the composer’s move to the Scottish Highlands in 1961, there is also a decidedly Celtic atmosphere. It is shocking to see how little of Wordsworth’s music is currently available on CD, although there are plenty of broadcast relays available on the internet which repay exploration. This composer deserves more plentiful modern performances, and we should be grateful for this one. The opening movement has a hieratic grandeur, and the closing ‘finale’ section has a quirky insouciance which should raise a wry smile. It is perhaps unfortunate that the works by William Busch and Kenneth Leighton which precede it on this disc are more forbidding and less approachable. Robert Kay notes the influence of Shostakovich on both works, but the material is quite tough in manner and the strenuous demands on both players do not always make for comfortable listening. William Busch’s Suite consists of four fairly brief movements, but the Leighton Partita is rather more substantial with a third movement consisting of a theme and variations (separately tracked) which extends over ten minutes in length. There is therefore plenty of variety in these pieces, although even the opening Elegy of the Leighton work is correctly described in the booklet as “jagged”. The best of both Busch and Leighton is to be found elsewhere. The sonata by Arnold Cooke was not performed at all during the composer’s lifetime, and was indeed given its public première by these same artists as late as 2006 - after the date of this recording. This is perhaps not so surprising when one learns that Cooke’s final Sixth Symphony remains unperformed to this day. In this sonata one finds Cooke turning away from the neo-classical influences of his earlier music to a more rhapsodic pastoral style which indeed recalls Vaughan Williams; does one detect a distorted quotation of the folksong The water is wide in the first movement (track 18, 1.15)? There is a heartfelt slow movement, a lively scherzo and a chugging finale, too. The music does not have the sheer panache of the Wordsworth — there are some sequential passages which sound a bit contrived — but it runs it a close second. As I have stated earlier, this disc is self-recommending, and indeed required listening for anyone who wishes to explore the byways of more ‘traditional’ British composition in the second half of the twentieth century. We are not likely to get further recordings of the music – and indeed any prospective rival would have its work cut out to match these performances – so potential purchasers are advised to snap this one up while it remains readily available. The Wordsworth and Cooke sonatas in particular will give them much enjoyment.